Project partners in EKLIPSE create and develop a self-sustaining mechanism that will continue after the project is finished. To ensure the mechanism’s sustainability, we work with the wider community in developing a business plan. Our vision is to create a flexible, durable but innovative, challenging but ethical mechanism for evidence-informed decision-making affecting biodiversity and ecosystem services. Once established, the self-sustaining mechanism will be handed over to the wider community of institutions, knowledge holders, and stakeholders. 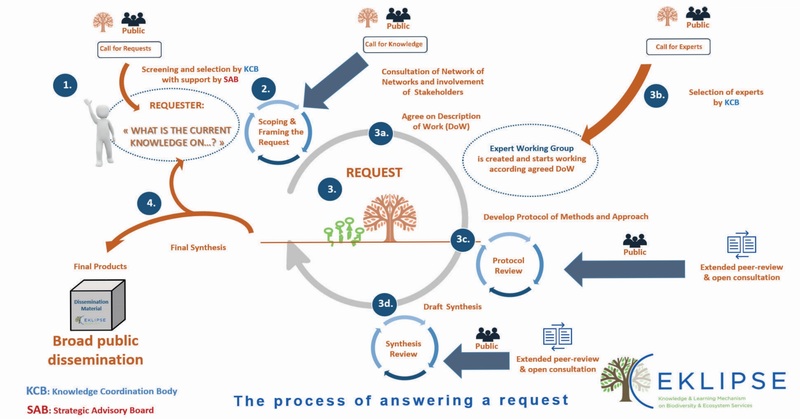 EKLIPSE facilitates knowledge compilation in response to questions from decision-makers on biodiversity and ecosystem services that require in-depth collection, analysis, and synthesis of existing knowledge from science and other sources of knowledge. EKLIPSE improves the integration of emerging issues into policy development and research funding related to, or impacting on, biodiversity and ecosystem services. EKLIPSE is building a virtual community of people and institutions that are willing and committed to work with colleagues to make sure their collective knowledge and values on biodiversity and ecosystem services are used to support decisions that impact our environment and our well-being. EKLIPSE encourages citizen engagement and societal debate with policy and research on biodiversity and ecosystem services. Registration is now open! Come and join us at the second European Urban Green Infrastructure Conference (EUGIC), which is organized in Budapest this November and focuses on nature based solutions for cities.